The LLRF was designed to simulate impacts. 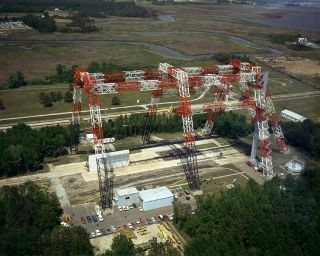 This historical photo from the U.S. space agency, taken in May of 1974, shows the Langley drop test facility where aircraft crashes can be simulated. The grid screen at the left of the facility is used as a backdrop for the impacts to allow engineers to measure angles and impact speeds. This facility was originally built to test a lunar lander simulator.